We Sindhis are cooking all the recipes in a different manner. If you feel bored with Dal. So let’s try our special Sindhi Tridali Dal. This is continuing full fiber, nutrition, and proteins. 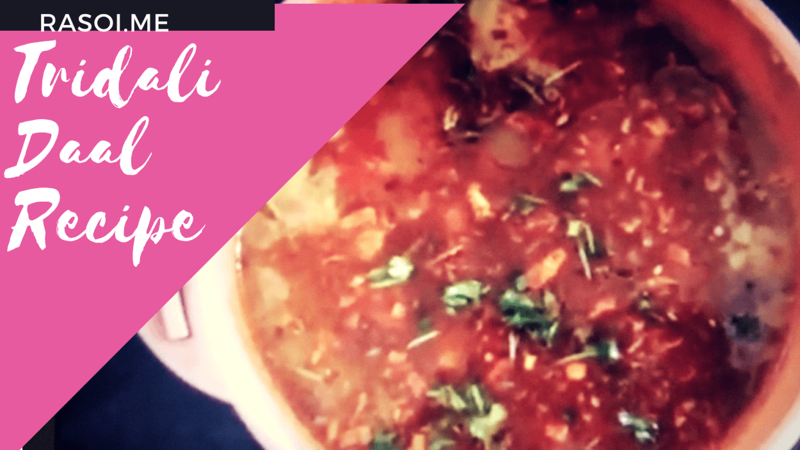 It’s easy to cook at home watch this easy homecooked recipe of Tridali Dal. Watch the video must share , like and comment and subscribe us on the youtube channel today. Heat pressure cooker add all three dals in cooker, add 2 glass water, 2 green chills chopped, 2 tomatoes and 1 spoon salt, 1 spoon turmeric powder. 2 drops oil and lock the pressure cooker and take 5 whistle and put it on slow flame for 10 minutes. Pressure open then me mesh the dal with spoon or we use Dal Madida or grinder to merge it properly. when its merge add 1 cup water and heat it for 10 minutes in cooker. Add 1 spoon lemon juice in it. When its totally done we add the Tadka on Dal. For Tadka we need Rai jeera and garlic chopped. Heat oil in frying pan add garlic, rai and jeera and saute it for 3 minutes garlic is light brown switch off the gas and add the red chilies powder 3 tsp in oil. Tadka is ready add it to Dal. GArnish with Coriander leafs. Sindhi special Tridali Dal is ready to serve. Serve it with Rice or butter roti. No Replies to "Sindhi Tridali Daal Tadka Recipe"